Gaertnera obtusifolia , (DC.) Roxb. Hiptage benghalensis , (L.) Kurz forma typica Nied. Hiptage benghalensis , (L.) Kurz forma macroptera (Merr.) Nied. Hiptage benghalensis , (L.) Kurz forma latifoliaNied. Hiptage benghalensis is a native of India, Southeast Asia and the Philippines. The genus name, Hiptage, is derived from the Greek \"hiptamai\" which means \"to fly\" and refers to its unique three-winged fruit known as \"samara\". Due to the beautiful unique form of its flowers, it is often cultivated as a tropical ornamental in gardens. It has been recorded as being a weed in Australian rainforests and is extremely invasive on Mauritius and Réunion, where it thrives in dry lowland forests, forming impenetrable thickets and smothering native vegetation. H. benghalensis is a high-climbing liana (woody, climbing vine) or large shrub, with white or yellowish hairs; leaves lanceolate to ovate-lanceolate, to 20cm (8 in.) long; flowers pink to white, with yellow marks, in 10-30-flowered racemes (Bailey and Bailey 1976, in PIER, 2002). It has scandent branches up to 5m high. Leaves simple, opposite, blade usually elliptic and 6-18cm long (2.5-7 in) with an attenuate tip. The plant flowers intermittently during the year, and produces fragrant flowers borne in compact axillary racemes. The corolla consists of five free, elliptic to round, reflexed petals 1-1.7cm long (3/8-3/4 in), white with one petal yellow in the center, margins fringed. Fruit a samara with three spreading, papery oblanceolate to elliptic wing 2-5cm long (3/4-2 in) (Whistler 2000, in Starr et al. 2003). H. benghalensis is widely cultivated in the tropics for its attractive and fragrant flowers; it can be trimmed to form a small tree or shrub or can be trained as a vine (Whistler 2000, in Starr Starr and Loope 2003). It is also occasionally cultivated for medicinal purposes (Starr Starr and Loope 2003). Hiptage holds a reputed position in Indian medicine. The leaves and bark are hot, acrid, bitter, insecticidal, vulnerary and useful in treatment of biliousness, cough, burning sensation, thirst and inflammation; it has the ability to treat skin diseases and leprosy (Agharkar, 1991). Habitat variable (Bailey and Bailey, 1976, cited in PIER, 2002). Prefers climates ranging from warm temperate to tropical. Dry and moist areas from sea level to 1000m (3500 ft.) elevation in Hawai‘i (PIER, 2002). Principal source: Pacific Island Ecosystems at Risk (PIER), 2002.
Review: Wendy Stahm Ph.D., IUCN Plants Officer. 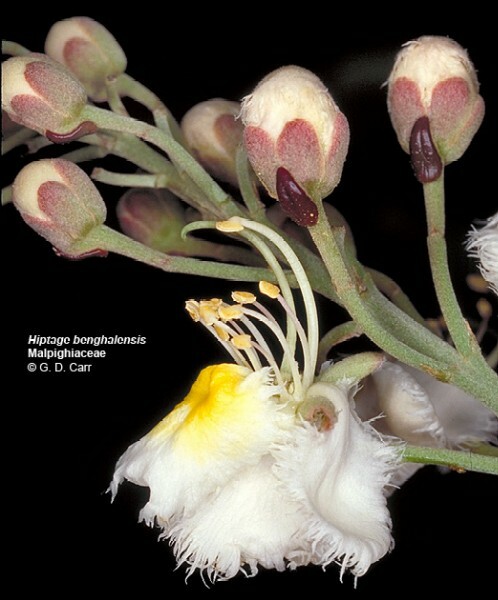 Recommended citation: Global Invasive Species Database (2019) Species profile: Hiptage benghalensis. Downloaded from http://www.iucngisd.org/gisd/species.php?sc=87 on 19-04-2019. H. benghalensis is reported as invasive in Florida, Hawaii, La Réunion, Mauritius and Western Australia (Randall 2002, in Starr Starr and Loope 2003). The Florida Exotic Pest Plant Council (FLEPPC 2001) lists H. benghalensis as a category II plant, which are species that have shown a potential to disrupt native plant communities (Starr Starr and Loope 2003). Randall (2002) lists this species in the global compendium of weeds for Western Australia (Starr Starr and Loope 2003) and in tropical Australian rainforests it is a pest (Grice and Setter 2002). On Réunion island it spreads widely by its wind-dispersed seeds and it reported to climb over and smother native vegetation (PIER 2002, in Starr Starr and Loope 2003). It is also reported as invasive in Mauritius (PIER 2002, in Starr Starr and Loope 2003). H. benghalensis is reported as invasive in Hawaii (PIER 2002, in Starr Starr and Loope 2003). In addition, this species is listed by Staples et al. 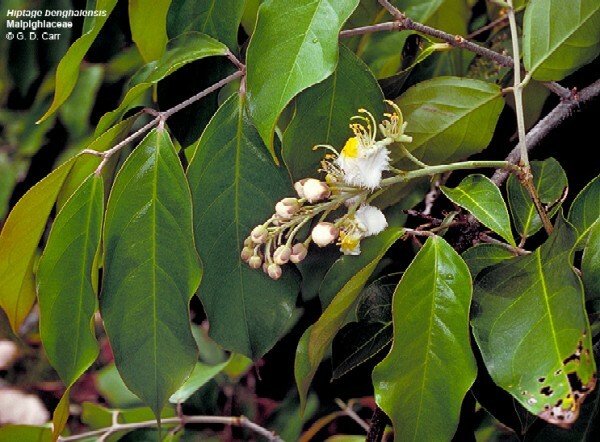 (2000) in their checklist of invasive or potentially invasive cultivated plants in Hawaii (Starr Starr and Loope 2003). Education and public awareness are appropriate cultural controls to ensure the weed is not planted as an ornamental near environmentally precious areas. In countries with tropical regions and warm climates such as Palau it is recommended that troublesome species (including H. benghalensis) should be prevented from reaching the country and establishing in native ecosystems such as tropical rainforests. Weed species should receive high priority for exclusion from entry into the country and promptly evaluated for eradication if found to be present. It is essential that plant growers are aware of the species' potential to become invasive in the wild (Starr Starr and Loope 2003). Informations on Hiptage benghalensis has been recorded for the following locations. Click on the name for additional informations. Florida Exotic Pest Plant Council (FLEPPC), 2001. List of Invasive Species. Summary: List of Invasive species in Florida, their category, common names and their general distribution in Florida. Information Ventures, Inc. Triclopyr - Pesticide Fact Sheet. Summary: Triclopyr herbicide fact sheet prepared for the U.S. Department of Agriculture. Available from: http://www.hear.org/pier/species/hiptage_benghalensis.htm [Accessed 5 February 2003]. Summary: Cook Island management of invasive plants including yellow ginger. Starr, F. Starr, K. Loope, L. 2003. Plants of Hawaii. United States Geological Survey--Biological Resources Division. Haleakala Field Station, Maui, Hawaii. Summary: A review of infomation on Hiptage benghalensis. Available from: http://www.hear.org/starr/hiplants/reports/html/hiptage_benghalensis.htm [Accessed 25 February 2003]. Conservatoire Botanique National De Mascarin (BOULLET V. coord.) 2007. - Hiptage benghalensis Index de la flore vasculaire de la R�union (Trach�ophytes) : statuts, menaces et protections. - Version 2007.1 (mise � jour 12 juin 2007). Plants Database, 2002. U.S. Department of Agriculture (USDA). Summary: Comprehensive information concerning taxonomy, distribution, life-history and ecology. Available from: http://plants.usda.gov/cgi_bin/topics.cgi [Accessed 29 January 2003]. Plants of Hawaii. 2005. Hiptage benghalensis (Hiptage Malpighiaceae). Queensland Herbarium, 2002. Invasive Naturalised Plants in Southeast Queensland, ranked list. Summary: Extracted from: Batianoff, George N. and Butler, Don W. (2002). Assessment of Invasive naturalized plants in south-east Queensland. Appendix. Plant Protection Quarterly 17, 27-34. This site records the top 200 invasive plants in Queensland. Starr, F., Starr, K. and Loope, L. 2003. Hiptage benghalensis (Hiptage Moraceae). Plants of Hawaii. 2003. Strahm, Wendy. 25 February 2003. Ph.D., IUCN Plants Officer. Summary: The Germplasm Resources Information Network - Canadian Version (GRIN-CA) web server provides germplasm information about plants within the Plant Gene Resources of Canada (PGRC) division of Agriculture and Agri-Food Canada (AAFC). GRIN-CA was created from the United States Department of Agriculture s National Plant Germplasm System (GRIN). Verma, D.M. Balakrishnan, M.P. and Dixit, R.D. (1993). Flora of Madhya Pradesh. Vol. I., Botanical Survey of India, Kolkata, India. P. 240. Wunderlin, R. P. and Hansen, B. F. 2003. Atlas of Florida Vascular Plants. Summary: A comprehensive searchable database of vascular plants in the state of Florida, USA. 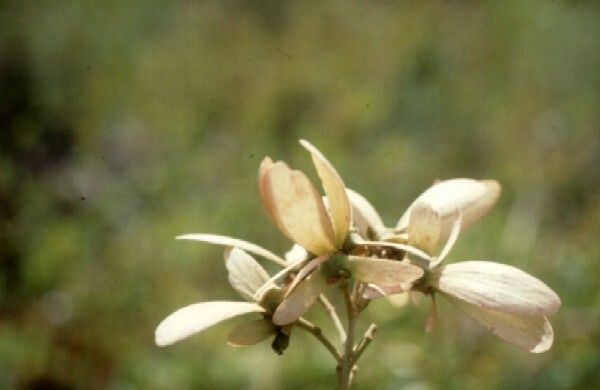 Available from: http://www.plantatlas.usf.edu/main.asp?plantID=4118 [Accessed 5 February 2003].